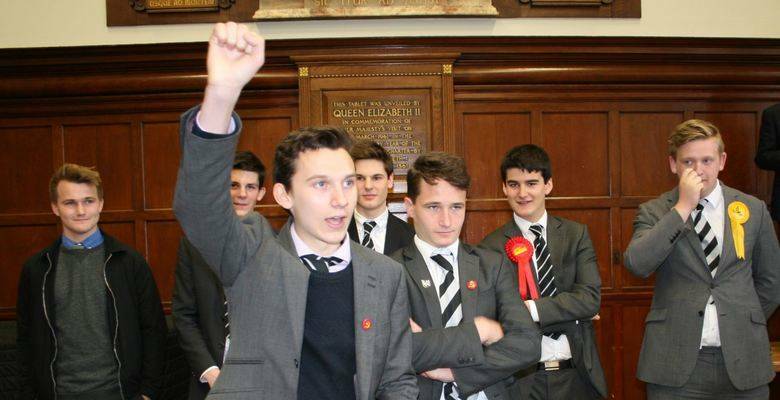 THE KGS MOCK ELECTION OUT-DID THE LACK-LUSTRE NATIONAL EVENT FOR EXCITEMENT AND CONTROVERSY, AND THE RESULT WAS EVERY BIT AS SENSATIONAL, WITH THE NARROWEST OF WINNING MARGINS. It is the day after the School Election, which witnessed a huge turnout of voters across all the age groups keen to exercise their democratic rights in one of the most closely fought and exciting elections of recent history. No fewer than six parties took part in a full and diverse campaign lasting more than a month which took in the writing and dissemination of manifestos; the publication of propaganda, much of it witty, original and thought provoking; soap box oratory; three Question Time events; a manifesto launch and a regularly updated online poll. The election has had its fair share of controversy, party defections and complaints to the School Electoral Board over ‘malpractice’ and the like, but it has all been in the best spirit of fun and good humour. On a more serious note, the educational value has been tremendous: the lunchtime debates have introduced the pupils to the concepts of left and right wing politics and to the ideologies of conservatism, liberalism and communism, and provided insight into the current policies and aspirations of the actual parties operating out of Westminster. We have had our Election Analyst who, in total anonymity, gave us a weekly assessment of the state of the parties, which was mainly impartial, usually irreverent but always humorous in its depiction of the foibles, weaknesses and errors of the main contestants. After the excitement of the night nationally and with sensational results still coming in, the KGS declaration was keenly awaited, and it was a febrile crowd who crammed into the Hall at break to hear the returning officer, Mrs Jackson, deliver the verdict of the candidates’ peers and pedagogues. And the result lived up to all the hype and could not have been closer, with just seven votes separating the top three parties, and a winning margin of just two. This it was that the Matt Maginnis (LibDem) came third with 124 votes, just 5 behind James Wakefield (Conservative), while victory, with a majority of two (they must be glad they both voted! ), went to the Communist Party, led jointly by Julian Style and Fergus Ainsworth. Our congratulations to the winners and to all who took part, and thanks to the superb Anonymous Analyst as well as to Mr Sorley, Mrs Jackson and the many other members of staff who presided over this supreme example of the democracy in action.